- Here are some of our most recent requests. In 1982 the Baergens came to live in the capital city of Salta and almost immediately began working to win people for the Lord and establish a local congregation. The area where they began was an area on the south side of the city. Called the Lavalle area, the neighborhood was best known for crime and poverty. There was a small group of believers, mostly young people, who had a Bible Club for children in the Lavalle area and the Baergens worked with this group as a team. Soon there was a small group meeting for preaching and teaching services on a big porch that they erected on the back of a home of some professing Christians in the area. 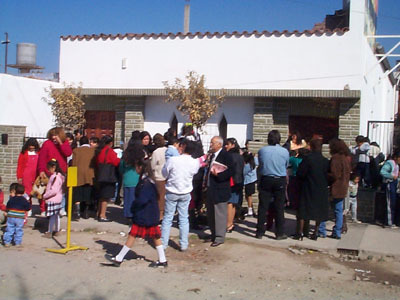 After a few months, the group purchased a lot in the center of the Lavalle area and began to build a chapel. By the early months of 1983 they started a Sunday School on the new premises, with a very simple building and a large lot on which the classes could meet. The Baergens seek to follow the Scriptures in congregational matters. They believe that the Bible gives clear guidelines regarding many aspects of local assembly life. These include the plurality of elders in the local fellowship and encouraging each of the believers to discover and practice the gifts that the Holy Spirit has given. Also included in the Scriptural principles that they seek to teach and encourage in the local congregation is the complete brotherhood of believers and the body of believers who function according to the directions of the one Head of the Body, the Lord Jesus. As missionaries, the Baergens seek to have the local Christians search the Scriptures and follow the Scriptures themselves, rather than patterns that missionaries have been accustomed to. At present the greatest need in the Lavalle congregation is for spiritual maturity in the believers in all aspects of life. There are many opportunities to reach out to the area in and around the Lavalle area. The local body of believers is taking advantage of some of these opportunities but much more could be done if the local Christians would be willing to sacrifice more of their time and material goods for the Lord's sake.